Welcome and thank you for choosing me for the treatment of your pain. As a practicing family physician for the past 30 years, I value the importance of continually incorporating new cutting-edge methods of pain treatment into my practice. 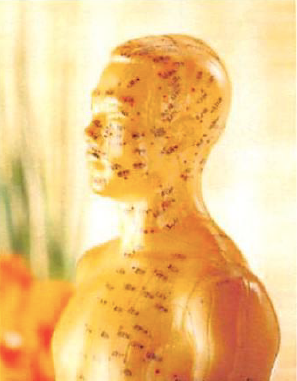 I initially started with acupuncture in 1995. In the past eight years, I have expanded my expertise to include two other forms of therapy called trigger-point therapy and laser acupuncture therapy. These three treatment methods can be used in combination or separately, depending on the nature of the condition. I tailor each treatment to the specific needs and responses of the patient, and so I will utilize any one or a combination of these treatments. While acupuncture has been around for a long time, and most people understand it, these two other forms of therapy have much to offer but are less understood. 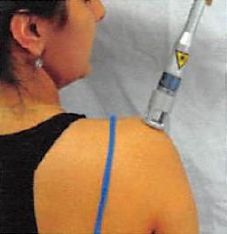 Most people have not heard of trigger-point therapy or laser therapy, because both are contemporary advances and not many practitioners have gained expertise in this type of therapy. 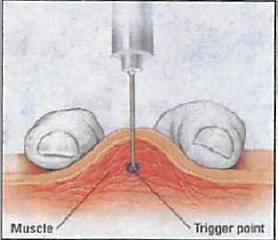 Most people assume that local anaesthetic is only used for freezing, but it has another property of blocking pain pathways on a long-term basis. I use a very small amount of local anesthetic, essentially just one-to-two drops per knot. That is all that is needed to change the nerve signal. During the treatment session, the muscle is never frozen and there is no feeling of numbness that one would normally feel, for example at the dentist. Like other therapies, muscles can become aggravated for a few days; however, the discomfort is only temporary and pain symptoms are decreased thereafter. I usually prescribe trigger-point therapy before acupuncture or laser therapy, because it offers the most benefit for most patients. It works quickly and with minimal side-effects. And it is covered by MSP. 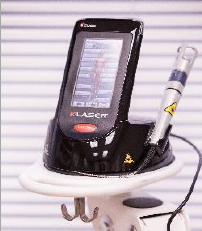 Laser therapy is an emerging technique that I have incorporated it into my practice since September 2009. This involves using an infrared light, which is an invisible beam of light that activates certain cells to increase the metabolism of the cells. By enhancing the activity of the cells, it increases the anti-inflammatory chemicals released by the cells and thereby relieves pain. There are many studies regarding laser therapy and most of these demonstrate relief for at least 60% of patients. I am using a Class 4 laser. Because of the potency of this laser, treatment times are only between 5 to 10 minutes. Laser therapy is painless and there are no side effects associated with it. Although this therapy is not covered by MSP, it is efficient. I also use laser therapy on acupuncture points to stimulate acupuncture points, which enhances these two therapies and leads to faster results. I primarily use trigger-point therapy for pain relief, but if tightness persists in the muscle I use laser acupuncture which have proven to be effective. These two methods of therapy have been very successful; in fact, I have had success rate of more than 70% for pain-related conditions. For more information about all these therapies and associated links, please visit my web site, www.rejuvmedicalfitness.com. Again, thank you very much for choosing to come to see me. I hope that I can help you and relieve you of your pain.